You lose all life. If you gain life later in the game, instead draw one card from your library for each life. For each point of damage you suffer, you must destroy one of your cards in play. Creatures destroyed in this way cannot be regenerated. 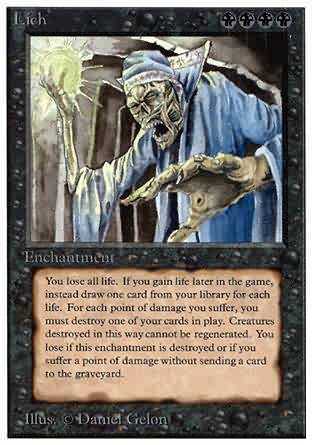 You loseif this enchantment is destroyed or if you suffer a point of damage without sending a card to the graveyard. As Lich comes into play, your life total becomes 0.